A New Map of the World on Globular Projection. 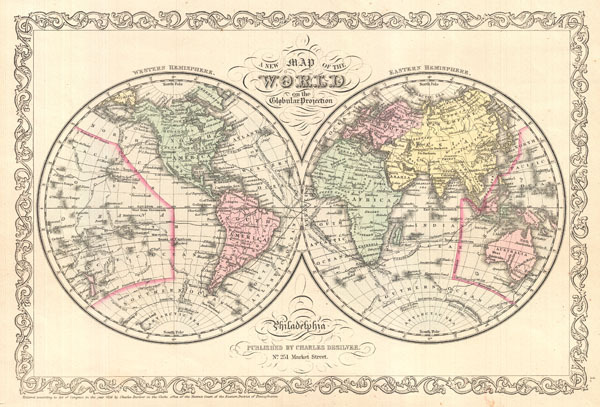 A fine example of Charles Desilver's 1856 double hemisphere map of the World. Covers the entire world with color coding according to continents. The map shows recent discoveries in the Antarctic as well as the routes of various prominent explorers including Cook, Gore, and the U.S. Exploring Expedition. Desilver began issuing this map in 1856 when he acquired S. A. Mitchell's copyrights and printing plates. Desilver's changes to Mitchell's plates are largely limited to his addition of the grillwork border seen here. However, the most significant difference between the two publishers is Desilver's choice of a completely new color scheme, forgoing Mitchell's intense greens and blues for Colton's yellow and pink pastels. Issued as plate no. 1 in the 1856 edition of Desilver's New Universal Atlas. Desilver, C., A New Universal Atlas Containing Maps of the various Empires, Kingdoms, States and Republics Of The World., (Philadelphia) 1856. Rumsey 4557.003. Phillips (Atlases) 6135.